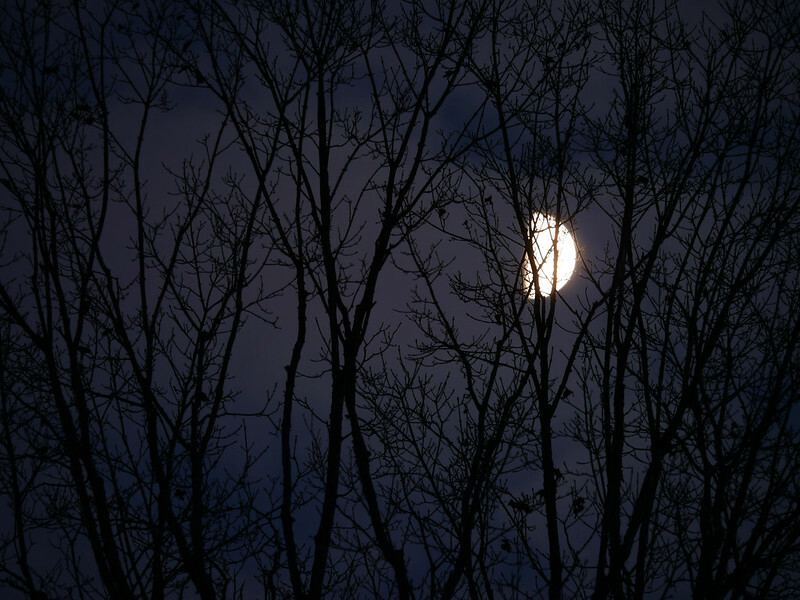 Earlier this evening I spied on the moon through the branches of the huge Maple tree in our yard. Now, when I’m here at my desk, wondering what on earth to write about, the moon is spying on me (M told me so just a minute ago). What can I possibly write that the moon hasn’t already read? What can I do but describe the cold blue-black night, the dying glow of the fires, the dogs lying like moored boats in a moonlit harbor, another load of dirty dishes piled in the sink, the stereo playing some piece of music I feel I know but can’t name, the moon sailing her orbit while we sail ours, the end of the day. Same old story, says the moon in a comforting way. Time to turn out the lights, pull the night up to your chin, feel quiet and planted, like a Maple tree on a November night.